Upright, comfortable, zippy, and so much fun! 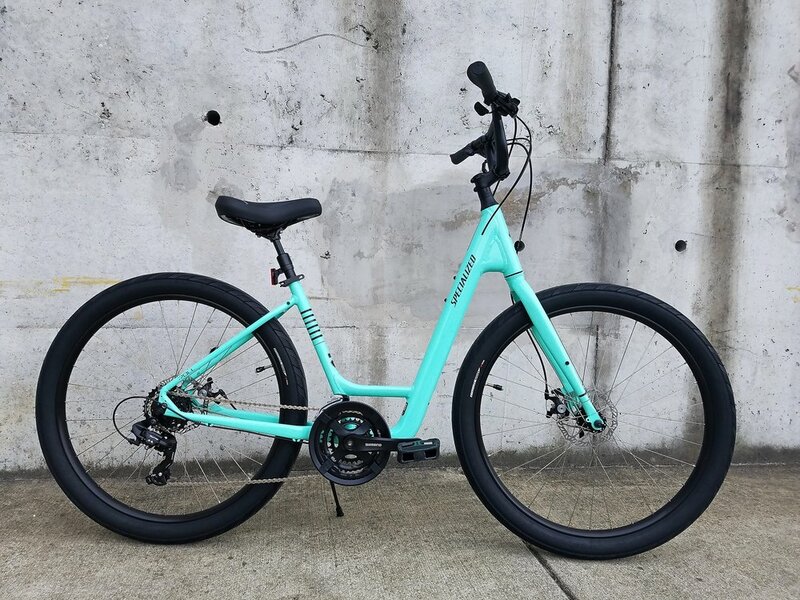 If you’ve been looking for the bike that feels like a beach cruiser, but isn’t so heavy, gives you all of the gears you need for hills, and zips around town, the Roll Sport is the bike for you! One of our favorite bikes, the Roll will put a smile on your face every time you ride it. The Roll Frame is made from Specialized Bicycles’ A1 Premium Aluminum. It features their Ground Control Positioning that makes it easy to put a foot down when stopped, while our Low-Entry design makes getting on and off a breeze. Lastly, the frame comes ready with rack/fender mounts. Equipped with the Body Geometry "The Cup" saddle, you can expect a supreme level of comfort anywhere you take the Roll. It delivers on these expectations by "cupping" your sit bones, which reduces pressure without feeling obtrusive or constraining. Big tires provide comfort and stability. But don’t let their size fool you, they zip around! All of the gear options you could want for riding in varying elevations! Yes, this bike comes with a kickstand! Yay!